If you are following our mutual friend, Daryl Shaber on Twitter you have come across the Salesforce Dashboard resume created by me. If you have not seen it, you are welcome to see the original first version and the version 2.1 with some more added features here. For those who joined in late (I always wanted to say that, ignore if you didn't understand the reference) it happened on one night when I could not sleep. I had experimented with coffee and red bull (I dare you don't do it) and had lost one night of sleep. I was reading about the modern way of resume building. People were showing off their info-graphic resumes and that is something, I wanted to do. 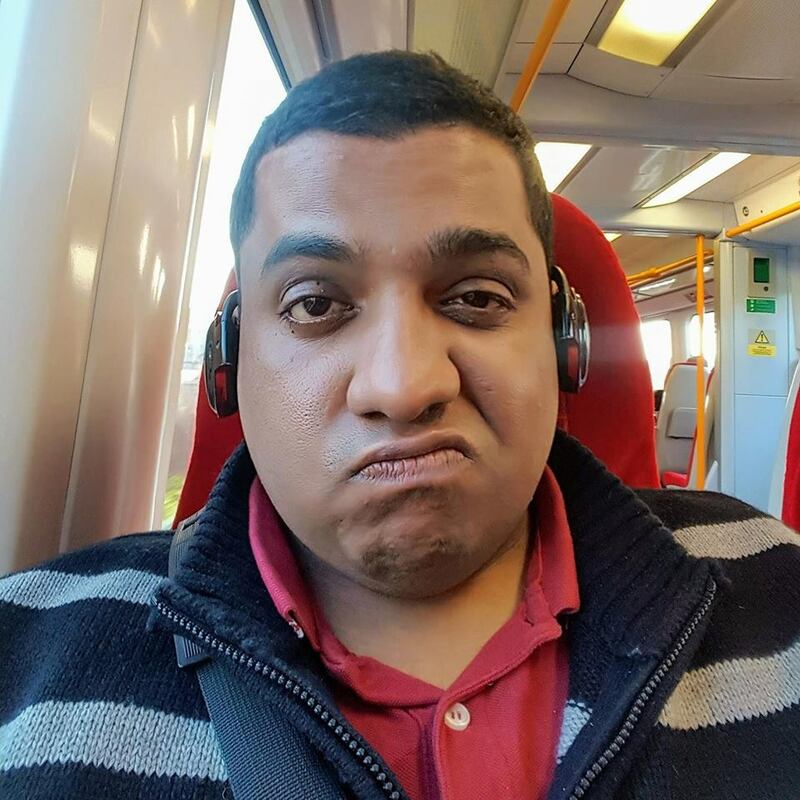 As a Salesforce consultant what was any better way to show off infographic resume than using Salesforce reports and dashboards to do it. Many people requested that they wanted a similar resume and hence, I have deployed a package on AppExchange. It is a private listing, use this link to access it. It is a complete unmanaged package and there is no support for it. Its very simple, add your data in the objects and go crazy. 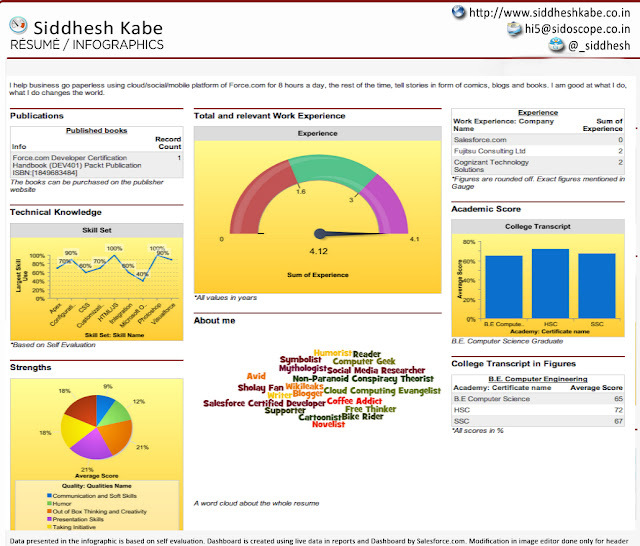 I have two sample dashboard inside but Ill request you play with it and built your own resume. To know more about reports and dashboard you can use this link or better google it. Take a screenshot of the finished dashboard and you can add the header to it. I use Pixlr.com which is a cloud based photo editor to add the header. If all goes well you will have something similar to this. 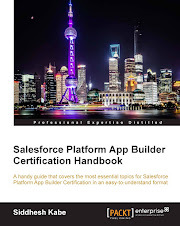 I want to go ahead in my carrier as a developer for SalesForce . I have worked a little as a Java developer . But was not a very good Java code developer . I have heard that the Visual force and Apex are much in similar to Java and HTML . Whats the level of difficulty learning them and executing them in the live environment . 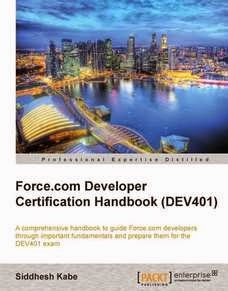 And also with an SalesForce Administrator 201 and Developer 401 certification will i be able to apply for a Developer job in a company or i need 501 training and certification mandatory ? Looking forward to your reply . Please help me decide .